USDOT# 3055212-I have a 3500 2016 Silverado dually with 35" Gooseneck 12 ton flatbed trailer. We can haul up to 20,000 pounds. Interstate Authority for lower 48 states. Centrally located on the Georgia/Florida state line. Fully insured with $1,000,000 lib plus $100,000 cargo. 20 year Class A CDL drivers with a clean record. - Team operation. Ready to do hotshot and LTL loads, fast and safe. We can haul about anything, except hazmat. Have references on request. Ready to go! We are a Hotshot company based in the Oklahoma City metro area. Licensed and Insured for all lower 48 states. We have 1 tons with 40 ft. Trailers shipping up to 13,000 pounds 30 ft. Trailers shipping up to 8,000 pounds and 3/4 ton pick ups to meet your needs. We are a group of Veteran US Marines, Sailors, and Soldiers ready to meet your needs. We will do what it takes to earn your business! Hotshot company I have a 40ft gooseneck trailer can load up to 11000# looking for loads in an around texas. We are a hot shot load company with a lot of ambition to do well. We offer highly experienced drivers who are passionate to get your load to its destination safely and promptly! CAPS Dispatch Services Is Accepting New Trucking Companies seeking Full Time Dispatching Services. CAPS is concerned about your Bottom Line. CAPS will keep you MOVING and will help you to stay PROFITABLE. Call Today To Begin Services & Get your 1st Load For Free! Dispatch company specializing in Dry Van, Flatbed, Reefers, and Hotshots. We will Handle all necessary faxes and paperwork, including broker/shipper setup, insurance certificates and rate confirmations. I have a 2017 Ford Dually and a 40 foot air ride gooseneck trailer. DL Transport is a husband and wife owner/operator team located in Strawn, Illinois. We have a 2015 Ram 3500 dully and a 40ft gooseneck trailer with monster ramps. We can haul up to 10,000lbs in Illinois and surrounding states. We have our own authority and are fully insured. We will transport to most cities in the country. We are fully insured and licensed and offer competitive rates. This includes individuals, military and government personnel, as well as major corporations nationwide. We operate a 24' Gooseneck flat deck trailer. We haul up to 12000 lbs. We strive to provide the utmost level of professionalism, courtesy and integrity. Wherever you're going, let the Best Thing Smoking, LLC make sure your shipment gets there safely, securely, and on time! Please call to schedule your pick up today! Capable of hauling loads up to 16,000 lbs. Run hotshot with a 40' gooseneck. 15K max. We specialize in Overnight, Same Day, Rush, Dedicated Expedited services. From Shop direct to Jobsites. Offering Flatbed Straight Truck, Flatbed Gooseneck Services 25-40ft. Transporting Machinery, Construction materials, any items requiring Flatbed Services. Very Dependable and most important on TIME. Call Today and have your shipping needs taken care of. Worry Free. Deliveries to and from: Manufacturing plants, factories, commercial paint shops, sand blasting facilities, galvanizers, construction sites, residential etc. 3 Heavy Duty Trucks. One A Flatbed. Been Moving Cargo Trailers For 25 Years ! I can haul up to nine thousand pounds. And, I am fully insured. 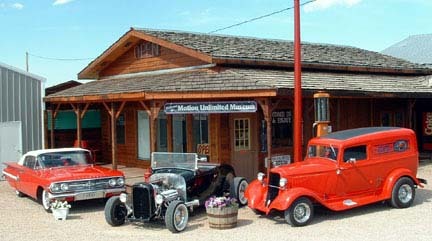 We have an Antique/Classic Car Museum, and an Antique/Classic Car Lot Located In Rapid City South Dakota. We sell cars and trucks all over the US, and Worldwide. We are looking for truckers to haul vehicles for us. We are not brokers, you get the entire amount of shipping fee when you deliver a vehicle. We Also Can Assist In Loading The Vehicles. Hot Shots, Auto Transports, Drop Decks, Etc. Please Give Us A Call If You Are In The Rapid City, South Dakota Area. 2 Diamonds - Haulage and Transportation, LLC. For all your short haul needs. 2016 Silverado, 28ft gooseneck trailer, 12k payload, 200k cargo coverage. Looking for loads within Florida. I am a new Hot Shot freight and auto carrier that is licensed and insured. Dispatching company specializing in Hotshots, flatbeds, Dry Van, Refer and Power Only. We work with a Factoring company to get you paid fast fuel advances available in most cases so no waiting 15-45 days to get paid. We offer Full Back Office Support. Hotshot Carrier. We are a small company looking to fulfill your needs. Capable of hauling loads up to 18000 lbs. Have Dodge 3500 with 40ft flatbed gooseneck. Licensed and Insured in the lower 48 states. Hot Shot Carrier - One ton truck w/35' flat trailer w/ mega ramps. Lowery Logistics LLC is a fully licensed and insured hot shot company for hire. We utilize 40ft flat bed trailers to move your freight, equipment and more throughout the southeastern state in a safe and timely manner. We are a small family owned business looking to expand and grow our clientele. We can haul up to 26.000 lbs, 25 ft long, 8 feet wide on our rollback carrier truck. USDOT# 3055212-I have a 3500 2016 Silverado dully with 35" Gooseneck 12 ton flatbed . We can haul up to 22,000 pounds. Interstate Authority for lower 48 states. 35 years class A CDL driver with a clean record. Ready to do hotshot and LTL loads, fast and safe. Endorsed with class 9. We can haul about anything, except hazmat. My name is April. I am new to this site but not new to hauling. I am a hotshot with 40' gooseneck trailer. 26ft box truck with lift gate. Can handle up to 7k pounds. Ultratrans has been in the transport and delivery business for over 25 years. We are fully FMCSA compliant and carry both liability and cargo insurance. Our USDOT number is 2820007. We offer 5th Wheel, Gooseneck and Bumper pull tow away service. We haul all types of trailers pulled with a 1 ton Ram 3500 dually. We offer enclosed transport with our 48' gooseneck trailer. Packages, Furniture, High end vehicles, parts and accessories, Motorcycles, ATV's, UTV's, Lawn mower equipment, Snowmobiles, basically anything that will fit in the trailer. We serve all 49 States and Canada. We carry a TWIC card for port deliveries and military bases. Our largest asset is expedited service. We are able to accommodate last minute shipments and get your product delivered in a timely and affordable manner. We are considered a "hot shot" service and our power unit is a 1 ton Ram dually plated at 38K #'s. Very professional, army vet, on time service, CDL. One ton truck with 36'trailer hauling up to 20000 lbs.. I have a 2017 Dodge 3500 4x4 with a 35 foot mega ramps. We are a family owned co. 24/7 dispatch, 48 state authority, and fully insured .